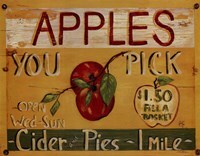 This vintage style print is of a road sign advertising Strawberries for sale at 50 cents a basket and pies at $1.75. 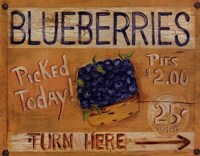 At the center of the print is a bright red strawberry with the words “Pick Your Own”. On the bottom of the print are directions. These are all set on a lilac blue background. 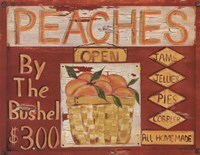 It is an example of the many folk art paintings by Grace Pullen. 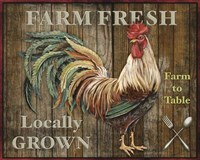 Finished off as a museum wrapped canvas, this print will add color to a country style kitchen.